My goal is to create an unforgettable experience for you based on your interests and passions. I want you involved in the planning of your custom tours, based on your interests. My tours are high-energy, personal, intense, fun, dramatic, passionate, tasty and smart. My work is based on memory, reading, and personal experience. I appreciate high culture, low-brow, and everything in between. I love history and pointing out ironies and poetry in meaning through space and time. My tours show an appreciation for the major monuments, the overlooked, the forgotten. The great figures from history and the regular guys and gals pop in and out, inspired by the streets, parks and buildings. I will work with you to bring all of this into the topic and location of your choice. 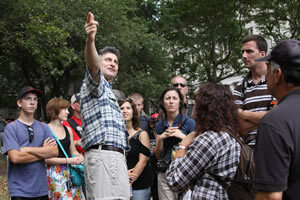 I rarely have regularly scheduled tours - all of my tours are custom based on your timing and interests. I can accomodate groups of just a few to a few dozen! You tell me what topic or location(s) you would like to tour, and for how long. I'll do the rest! If you need ideas it may help to visit our Destinations page. Once you have an idea of how you and your group would like to spend the few hours or a full day, tell me about it by filling out the form on our Book Your Tour page. I will them contact you about pricing and the details of your tour. Feel free to call me to see if you feel comfortable with my style. Talk with me about your goals, any special needs, or questions planning your trip so your time in NYC and in NYC with me is best spent. Thank you for considering me and a visit to NYC! I think you will be pleasantly surprised.